Terms and Conditions for the U.S. Money Visa® Prepaid Card Card. 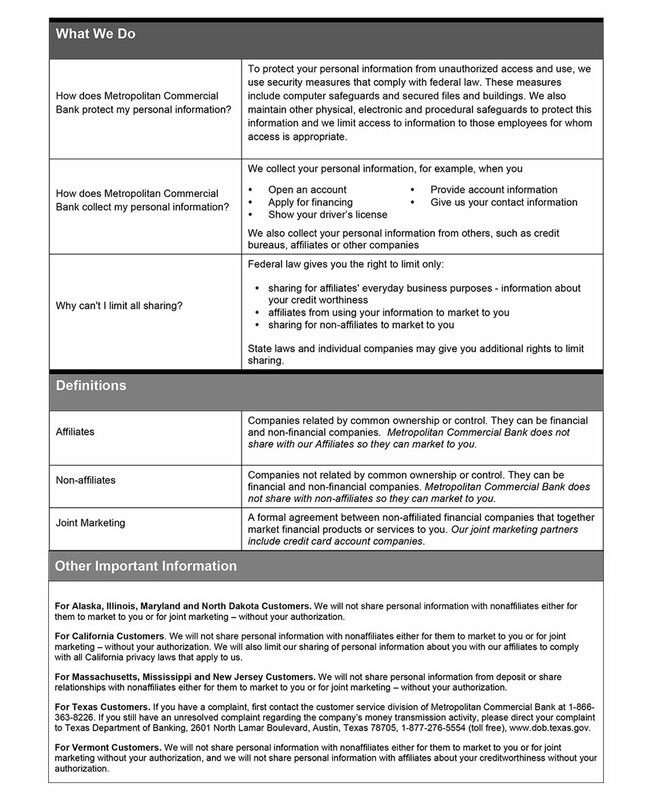 This document constitutes the agreement ("Agreement") outlining the terms and conditions under which the U.S. Money Prepaid Visa Card has been issued to you by Metropolitan Commercial Bank (Member FDIC) pursuant to a license from Visa, U.S.A., Inc. "Metropolitan Commercial Bank" and "Metropolitan" are registered trademarks of Metropolitan Commercial Bank © 2014. By accepting and/or using this Card, you agree to be bound by the terms and conditions contained in this Agreement. In this Agreement, "Card" means the U.S. Money Prepaid Visa Card issued to you by Metropolitan Commercial Bank, including any Secondary Card(s) you may request. "Card Account" means the custodial sub-account we maintain on your behalf to account for the transactions made with your Card, Card Number or Account Number. "Card Number" is the 16-digit number embossed on your Card. "Account Number" means the 13-digit number used to identify your Card Account. "You" and "your" means the person or persons who have received the Card and who are authorized to use the Card as provided for in this Agreement. "We," "us," and "our" mean Metropolitan Commercial Bank, our successors, affiliates or assignees. The Card will remain the property of Metropolitan Commercial Bank and must be surrendered upon demand. The Card is nontransferable, and it may be canceled, repossessed, or revoked at any time without prior notice subject to applicable law. Please read this Agreement carefully and keep it for future reference. To help the government fight the funding of terrorism and money laundering activities, Federal law requires all financial institutions and their third parties to obtain, verify, and record information that identifies each person who obtains a Card. What this means for you: When you apply for a Card, we will ask for your name, address, date of birth, social security number or country identification number, and other information that will allow us to identify you. We may also ask to see your driver's license or other documentation bearing your photo as verification of your identity. By participating in the Card program, you warrant factual representation of the required information is accurate, including, but not limited to, your real name, valid U.S. mailing address and residential address (if different), social security number or other identification documentation, date of birth, and telephone number. If you falsify, misrepresent, or fail to provide requested information, we may cancel your Card. In addition, funds tied to suspected illicit or illegal activity may be subject to both internal and potentially Federal investigation. We reserve the right to restrict or delay your access to any such funds. The Card is a prepaid card. The Card allows you to access funds loaded or deposited to your Card Account by you or on your behalf. The funds in your Card Account will be FDIC-insured once we have been able to verify your identity. You may access the funds in your Card Account by using your Card, Card Number, by automated clearinghouse (ACH) debit using your Account Number or by writing a Prefunded Check (as described in the Section 30 below entitled "Prefunded Check Transactions"). The Card is not a credit card. The Card is not a gift card, nor is it intended for gifting purposes. You will not receive any interest on your funds on the Card. The funds in your Card Account will not expire, regardless of the expiration date on the front of your Card. THE FEES RELATING TO THE USE (AND MISUSE) OF YOUR CARD ARE SET FORTH IN THE "SCHEDULE OF FEES AND CHARGES" ATTACHED TO THIS AGREEMENT AND INCORPORATED HEREIN BY REFERENCE. FEES INCURRED PURSUANT TO THE TERMS OF THIS AGREEMENT WILL BE WITHDRAWN FROM YOUR CARD ACCOUNT AND WILL BE ASSESSED SO LONG AS THERE IS A REMAINING BALANCE IN YOUR CARD ACCOUNT, UNLESS PROHIBITED BY LAW. You agree to pay all fees associated with the Card. We may from time to time amend the Fee Schedule, at our sole discretion as set forth in Section 26 below entitled, "Amendment and Cancellation." If you request a service that is not included in this Schedule of Fees and Charges and there is a fee for such service, such fee will be disclosed at the time you request the service and you agree that any such fee may be deducted from your Card Account. Click here to view Fee Schedule. You may request an additional Card ("Secondary Card") to allow another person to access the funds in your Card Account. The maximum number of additional Cards permitted is 2. If you permit another person to have access to your Card or Card Number, you are liable for all transactions made with the Card, Card Number or Account Number, and all related fees incurred, by those persons. To cancel an additional card, telephone the toll free number on the back of your Card or administrative office at 1-800-369-8493 and you must follow-up not later than 10 business days with the written notification to revoke (cancel) permission for any person you previously authorized to use your Card. Until we have received your notice of such a revocation (cancellation) and have had a reasonable time to act upon the written notification of revocation (cancellation), you are responsible for all transactions and fees incurred by you or any other person you have authorized. If you tell us to revoke (cancel) another person's use of your Card, we may revoke (cancel) your Card and issue a new Card with a different Card Number and/or Account Number. You are wholly responsible for the use of each Card according to the terms of this Agreement. 4. Card Account Use and Purpose. Subject to the limitations set forth in this Agreement, you may use your Card, Card Number, or Account Number, as applicable, to (1) add funds to your Card Account (as described in the Section 7 below entitled "Adding Funds to Your Card Account"), (2) transfer funds between Card Accounts, (3) purchase goods or services wherever your Card is honored as long as you do not exceed the value available in your Card Account, (4) withdraw cash from your Card Account (as described in Section 8 below entitled "Using Your Card to Get Cash"), and (5) make payments to third parties directly from your Card Account by writing Prefunded Checks (as described in Section 30 below entitled "Prefunded Check Transactions"). There may be fees associated with some of these transactions. For fee information, see the "Schedule of Fees and Charges" attached to this Agreement. You agree not to use your Card at casinos, for legal gambling, or for illegal gambling or any other illegal purpose. We will provide you our bank routing number and assign you a 13-digit Account Number once your identity has been verified. The bank routing number and your assigned Account Number are for the purpose of initiating direct deposits to your Card Account and authorized ACH debit transactions only. The 16-digit Card Number embossed on your Card should not be used for these types of transactions or they will be rejected. You are not authorized to use the bank routing number and Account Number if you do not have sufficient funds in your Card Account or to make a debit transaction with a paper check, check-by-phone or other item processed as a check except for Prefunded Check Transactions authorized by this Agreement. These debits will be declined and your payment will not be processed. You may also be assessed an ACH Decline Fee (see the "Schedule of Fees and Charges" attached to this Agreement). 5. Limitations on Frequency and Dollar Amounts of Transactions. The total amount of purchases and cash withdrawals (including withdrawals inside a bank office) that you can perform in any single day is set forth in the enclosed Schedule A - Cardholder Fees and Transaction Limits. The maximum aggregate value of your Card Account(s) is restricted to $10,000.00 at any point in time. We will determine any maximum value by aggregating the activity and value of all Card Accounts you may have with us. For security reasons, we may further limit the number or dollar amount of transactions you can make with your Card. 6. Personal Identification Number ( "PIN"). We will give you a PIN that you may use with your Card once your identity has been verified. Only one (1) PIN will be issued for each Card Account. You will need a PIN to obtain cash at an ATM or to make a PIN purchase or obtain cash back at a point-of-sale ("POS") terminal. You should not write or keep your PIN with your Card. If you believe that anyone has gained unauthorized access to your PIN, you should advise us immediately, following the procedures in Section 24 below entitled "Your Liability for Unauthorized Transfers." 7. Adding Funds to Your Card Account. You may add funds to your Card (called "value loading") at any time. Some reload locations may have limits on the minimum amount you may load to your Card. Absent special approval, the maximum aggregate value of funds in your Card Account(s) may not exceed $10,000 at any time. You agree to present the Card and meet identification requirements to complete value load transactions as may be required from time to time. Load locations may have their own load limits that may be less than our allowable amount. Load locations may also assess a fee to load funds to your Card Account. You cannot load your Card Account by check or money order. You may also direct deposit funds to your Card Account by providing our bank routing number and your assigned Account Number to your employer or other direct deposit payer (as described in Section 4 above entitled "Card Account Use and Purpose"). 8. Using Your Card to Get Cash. With a PIN, you may use your Card to (i) obtain cash or check your balance at any Automated Teller Machine ("ATM") that bears the Visa®, PLUS®, or STAR® brand, or (ii) obtain cash at merchants or banks that have agreed to provide cash back at POS terminals bearing the Visa®, PLUS®, or STAR® brand. All ATM transactions are treated as cash withdrawal transactions. The maximum amount of cash you may withdraw at an ATM is described in Section 5 above entitled "Limitations on Frequency and Dollar Amounts of Transactions." We may limit the amount of any individual ATM withdrawal, and merchants, banks and ATM operators may impose additional withdrawal limits. You will be charged a fee by us for each cash withdrawal and balance inquiry made at an ATM or cash withdrawal obtained through a bank teller, in the amount disclosed in the accompanying "Schedule of Fees and Charges." In addition, when you use an ATM not owned by us, you may be charged a fee by the ATM operator or any network used (and you may be charged a fee for a balance inquiry even if you do not complete a fund transfer). If you do not have enough value loaded on your Card you can instruct the merchant to charge a part of the purchase to the Card and pay the remaining amount with cash or another card. These are called "split transactions." Some merchants do not allow cardholders to conduct split transactions. Some merchants will only allow you to do a split transaction if you pay the remaining amount in cash. If you fail to inform the merchant that you would like to complete a split transaction prior to swiping your Card, your Card is likely to be declined. 10. Transactions Using Your Card Number. If you initiate a transaction without presenting your Card (such as for a mail order, Internet or telephone purchase, a Prefunded Check purchase or an ACH debit purchase), the legal effect will be the same as if you used the Card itself. 11. Your Obligation for Negative Balance Transactions. Each time you initiate a Card transaction, you authorize us to reduce the funds available in your Card Account by the amount of the transaction and all associated fees. You are not allowed to exceed the available amount in your Card Account through an individual transaction or a series of transactions (creating a "negative balance"). Nevertheless, if any transactions cause the balance in your Card Account to go negative, including any purchase transactions where the retailer or merchant does not request authorization, you shall remain fully liable to us for the amount of any negative balance and any corresponding transaction fees. You may also be liable for any related Insufficient Funds/NSF Fee(s) as set forth in the accompanying "Schedule of Fees and Charges." We reserve the right to bill you for any negative balance or to recoup such negative balance from any other Card we have issued to you. You agree to pay us promptly for the negative balance and any related fees. We also reserve the right to cancel your Card should you create one or more negative balances with your Card. You do not have the right to stop payment on any purchase transaction originated by use of your Card, other than a Recurring Transaction as described in Section 13 below entitled "Recurring Transactions." When you use your Card to pay for goods or services, certain merchants may ask us to authorize the transaction in advance and the merchant may estimate its final value. When you use your Card to obtain cash at an ATM or from a bank teller, we will authorize the transaction in advance (including all applicable fees). When we authorize a purchase transaction, we commit to make the requested funds available when the transaction finally settles and will place a temporary hold on your Card's funds for the amount indicated by the merchant. If you authorize a transaction and then fail to make a purchase of that item as planned, the approval may result in a hold for that amount of funds. Car rentals, hotels and other service oriented merchants may choose to factor in additional amounts upon check-in, and it may take up to sixty (60) days after your stay or your rental to have any excess amounts held by the hotel or rental company added back to your available balance. Similarly, some gas stations may factor in additional amounts to cover potential filling of the tank; if you want to avoid such a hold, you may want to pay inside the gas station, instead of paying at the pump. Until the transaction finally settles, the funds subject to the hold will not be available to you for other purposes. We will only charge your Card for the correct amount of the final transaction, and we will release any excess amount when the transaction finally settles. When you use your Card at certain restaurants and service-oriented merchants, there may be an additional 20% (or more) added to the authorization to cover any tip you may leave on the purchase. If this occurs, and your total bill, after adding in the additional 20% (or more), exceeds the amount available on your Card, your transactions may be declined. Accordingly, you should ensure that your Card has an available balance that is 20% (or more) greater than your total bill prior to using your Card. If you intend to use the Card for recurring transactions, you should monitor your balance and ensure you have funds available in your Card Account to cover the transactions. "Recurring Transactions" are transactions that are authorized in advance by you to be charged to your Card at substantially regular intervals. We are not responsible if a recurring transaction is declined because you have not maintained a sufficient balance in your Card Account to cover the transaction. If these recurring transactions may vary in amount, the person you are going to pay should tell you, 10 days before each payment, when it will be made and how much it will be. (You may choose instead to get this notice only when the payment would differ by more than a certain amount from the previous payment, or when the amount would fall outside certain limits that you set.) If your Card was obtained through your employer or you receive electronic deposits of Federal payments to your Card: If you have told us in advance to make regular payments (i.e., Recurring Transactions) from your Card Account, you can stop the payment by notifying us orally or in writing at least three (3) business days before the scheduled date of the transfer. If you call, we also may require you to put your request in writing and get it to us within 14 days after you call. If you order us to stop one of these payments three (3) business days or more before the transfer is scheduled, and we do not do so, we will be liable for your direct losses or damages. If you have authorized a merchant to make the recurring payment, you should also contact the applicable merchant in order to stop the transaction. If you have arranged to have direct deposits made to your Card Account at least once every sixty (60) days from the same person or company, you can call us at 1-866-872-9820 to find out whether or not the deposit was made. If you are entitled to a refund for any reason for goods or services obtained with your Card, you agree to accept credits to your Card Account for such refunds. You are not entitled to a check refund unless your Card has been closed. The amounts credited to your Card for refunds may not be available for up to five (5) days from the date the refund transaction occurs. 16. Card Cancellation and Suspension; Limits. We reserve the right, in our sole discretion, to limit your use of the Card, including limiting or prohibiting specific types of transactions. We may refuse to issue a Card, revoke Card privileges or cancel your Card with or without cause or notice, other than as required by applicable law. If you would like to cancel the use of your Card, you may do so by calling the number on the back of your Card. You agree not to use or allow others to use an expired, revoked, cancelled, suspended or otherwise invalid Card. Our cancellation of Card privileges will not otherwise affect your rights and obligations under this Agreement. If we cancel or suspend your Card privileges through no fault of yours, you will be entitled to a refund as provided below in Section 26 entitled "Amendment and Cancellation." Not all services described in this Agreement are available to all persons or at all locations. We reserve the right to limit, at our sole discretion, the provision of any such services to any person or in any location. Any offer of a service in this Agreement shall be deemed void where prohibited. We can waive or delay enforcement of any of its rights under this Agreement without losing them. If you initiate a transaction in a currency or country other than the currency or country in which your Card was issued, the amount deducted from your funds will be converted by Visa U.S.A., Inc. into an amount in the currency of your Card. Visa U.S.A., Inc. will establish a currency conversion rate for this convenience using a rate selected by Visa U.S.A., Inc. from the range of rates available in wholesale currency markets for the applicable central processing date which may vary from the rate Visa U.S.A., Inc. itself receives, or the government mandated rate in effect for the applicable central processing date, in each instance, plus or minus any adjustment determined by us. If you obtain your funds in a currency or country other than the currency or country in which the Card was issued, we may increase the currency conversion rate (described in Section 16 above) up to an additional 2% of the transaction amount and will retain this amount as compensation for our services. This charge is independent of and in addition to the currency conversion rate established by Visa U.S.A., Inc.
You should get or request a receipt at the time you make a transaction or obtain cash using your Card. You agree to retain your receipt to verify your transactions. You can get a receipt at the time you make any transfer from your Card Account using one of our ATM terminals. 19. Obtaining Balance and Transaction Information for Your Card; Periodic Statements. You should keep track of the amount of funds available in your Card Account. You may obtain information about the amount of funds you have remaining in your Card Account by calling the number on the back of your Card. This information, along with a 120-day history of account transactions, is also available on-line through our customer self service website shown on the back of the Card. You also have the right to obtain a 120-day written history of account transactions by calling the number on the back of your Card, writing us at 2690 Cobb Parkway Suite, A5-232 Smyrna GA 30080 or calling our administrative office at 1-800-369-8493. There may be a fee for obtaining a written history (see the "Schedule of Fees and Charges" accompanying this Agreement). 21. Our Liability for Failure to Complete Transactions. In no event will we be liable for consequential damages (including lost profits), extraordinary damages, special or punitive damages. We will not be liable, for instance: (1) If, through no fault of ours, you do not have enough funds available in your Card Account to complete the transaction; (2) If a merchant refuses to accept your Card or provide cash back; (3) If an ATM where you are making a cash withdrawal does not have enough cash; (4) If an electronic terminal where you are making a transaction does not operate properly, and you knew about the problem when you initiated the transaction; (5) If access to your Card has been blocked after you reported your Card or Access Code lost or stolen; (6) If there is a hold or your funds are subject to legal process or other encumbrance restricting their use; (7) If we have reason to believe the requested transaction is unauthorized; (8) If circumstances beyond our control (such as fire, flood or computer or communication failure) prevent the completion of the transaction, despite reasonable precautions that we have taken; (9) Any other exception stated in our Agreement with you. 22. In Case of Errors or Questions about your Card Account. Telephone us at the number on the back of your Card or write to us at 2690 Cobb Parkway, Suite A5-232 Smyrna GA 30080 as soon as you can, if you think an error has occurred in your Card Account. If your Card receives wages, salary, or other employee compensation that are made on a recurring basis or you receive electronic deposits of Federal payments to your Card, the following provisions of this Section also apply: We must allow you to report an error until sixty (60) days after the earlier of the date you electronically access your Card Account, if the error could be viewed in your electronic history, or the date we sent the FIRST written history on which the error appeared. You may request a written history of your transactions at any time by calling us at the number on the back of your Card, writing to us at 2690 Cobb Parkway, Suite A5-232, Smyrna, GA 30080 or calling our administrative office at 1-800-369-8493.You will need to tell us: (1) your name and Card Number; (2) why you believe there is an error, and the dollar amount involved, and (3) approximately when the error took place. If you tell us orally, we will require that you send your complaint or question in writing within ten (10) business days. We will determine whether an error occurred within ten (10) business days (five (5) business days for Visa Point-of Sale Signature unauthorized debit transactions) after we hear from you and will correct any error promptly. If we need more time, however, we may take up to forty-five (45) days to investigate your complaint or question. If we decide to do this, we will credit your Card within ten (10) business days (five (5) business days for Visa Point-of Sale Signature unauthorized debit transactions) for the amount you think is in error, so that you will have the use of the money during the time it takes to complete the investigation. If you do not have wages, salary, or other employee compensation made on a recurring basis or federal payments (for example, Social Security benefits, tax refunds or other government payments) that are deposited to your Card Account, we may not credit your Card. If we ask you to put your complaint or question in writing and you do not provide it within ten (10) business days (five (5) business days for Visa Point-of Sale Signature unauthorized debit transactions) we may not credit your Card. For errors involving new Cards, POS transactions, or foreign-initiated transactions, we may take up to ninety (90) days to investigate your complaint or question. We will tell you the results within three (3) business days after completing the investigation. If we decide that there was no error, we will send you a written explanation and debit your account for the amount of the provisional credit. You may ask for copies of the documents that we used in our investigation. If you need more information about our error-resolution procedures, call us at the number on the back of your Card. If your Card does not receive wages, salary, or other employee compensation that are made on a recurring basis or does not receive electronic deposits of Federal payments, all of this Section applies, except we will not credit your Card Account until our investigation is complete and we have determined an error occurred. 23. Lost or Stolen Cards/Unauthorized Transfers. If you believe your Card or Access Code(s) ("PIN") has been lost or stolen, call the number on the back of your Card or our administrative office at 1-800-936-4360 or write to us at 2690 Cobb Parkway, Suite A5-232 Smyrna, GA 30080 You should also call the number or write to the address shown here if you believe an electronic transfer has been made using the information from your Card or Access Code(s) (or "PIN") without your permission. 24. Your Liability for Unauthorized Transfers. You agree to exercise reasonable control over your PIN(s) ("Access Code(s)"); user ID(s); and password(s) and any other access code related to your Card Account (each, an "Access Code") and your Card. Tell us AT ONCE if you believe your Card or Access Code(s) has been lost or stolen. Also, if your transaction history shows transfers that you did not make, including those made with your Card, Card Number or Account Number, or you believe an electronic transfer has been made without your permission, tell us at once. Telephoning the toll-free number on the back of your Card or calling our administrative office at 1-800-369-8493 is the best way of keeping your possible losses down. You could lose all of the money in your Card Account. If you tell us within two (2) business days after you learn of the loss or theft of your Card, you can lose no more than $50.00 if someone used your Card without your permission. If you do NOT tell us within two (2) business days after you learn of the loss or theft of your Card, and we can prove that we could have stopped someone from using your Card without your permission if you had told us, you could lose as much as $500.00. If you do not tell us within sixty (60) days after the earlier of the date you electronically access your Card Account or the date we sent the FIRST written history on which the error appeared, you may not get back any money you lost after the sixty (60) days if we can prove that we could have stopped someone from taking the money if you had told us in time. If a good, documented, reason (such as a long trip or a hospital stay) kept you from telling us, we will extend the time periods. The following provisions of this Section apply to all Card Accounts: You will not be liable for unauthorized use that occurs after you notify us of the loss, theft or unauthorized use of your Card or Access Code(s). You also agree to cooperate completely with us in attempts to recover funds from unauthorized users and to assist in their prosecution. We may issue replacement Card(s) or Access Code(s) (PIN(s)), but only after you have provided such proof and security or indemnification as we may require. In addition, you acknowledge that we may have to deactivate your Card(s) and/or Card Account to prevent future losses. If you share your Card(s) or Access Code(s) (PIN(s)) with another person, use of your Card Account by that person may be considered as authorized. If you authorize another person to use your Card or Access Code(s) (PIN(s)), you agree that you will be liable for all transactions arising from use of the Card or Access Code(s) (PIN(s)) by such person except as otherwise set forth in this Agreement. In all cases, our liability for an unauthorized transaction is limited to reimbursing you for the face amount of the unauthorized transaction and any corresponding fees, except as otherwise required by applicable law. A transaction is unauthorized if it is not initiated by you, you did not give permission to make the transaction and you do not benefit from the transaction in any way. Visa's Zero Liability policy covers U.S.-issued cards only and does not apply to ATM transactions, PIN transactions not processed by Visa, or certain commercial card transactions. Cardholder must notify us promptly of any unauthorized use. Your Card and your obligations under this Agreement may not be assigned. We may transfer our rights under this Agreement. Use of your Card is subject to all applicable rules and customs of any clearinghouse or other association involved in transactions. We do not waive our rights by delaying or failing to exercise them at any time. If any provision of this Agreement shall be determined to be invalid or unenforceable under any rule, law, or regulation of any governmental agency, whether local, state, or federal, the validity or enforceability of any other provision of this Agreement shall not be affected. This Agreement shall be governed by the law of the State of New York except to the extent preempted or governed by federal law. We may amend or change the terms and conditions of this Agreement at any time. You will be notified of any change in the manner provided by applicable law prior to the effective date of the change. However, if the change is made for security purposes, we can implement such change without prior notice. We may cancel or suspend your Card or this Agreement at any time. You also may cancel this Agreement by returning the Card to us or by calling customer service at the number on the back of your Card. If your Card is cancelled by you or us when the Card has a balance, we will send you that amount by sending you a check at that address we have for you in our records. Your termination of this Agreement will not affect any of our rights or your obligations arising under this Agreement prior to termination. 28. No Warranty Regarding Goods and Services. This Arbitration Provision sets forth the circumstances and procedures under which claims (as defined below) shall be arbitrated instead of litigated in court upon the election of either party. (a) Definitions: As used in this Arbitration Provision, the term "Claim" means any claim, dispute or controversy between you and us, or between you and FirstView Financial, LLC or any of its agents or retailers, arising from or relating to the Card or this Agreement as well as any related or prior agreement that you may have had with us or the relationships resulting from this Agreement, including the validity, enforceability or scope of this Arbitration Provision or the Agreement. "Claim" includes claims of every kind and nature, including but not limited to initial claims, counterclaims, cross-claims and third-party claims and claims based upon contract, tort, fraud and other intentional torts, statutes, regulations, common law and equity. The term "Claim" is to be given the broadest possible meaning that will be enforced and includes, by way of example and without limitation, any claim, dispute or controversy that arises from or relates to (i) your Card, or the Cards of any additional cardholders designated by you; (ii) the amount of available funds on the Cards; (iii) advertisements, promotions or oral or written statements related to the Cards, goods or services purchased with the Cards; (iv) the benefits and services related to the Cards; and (v) your enrollment for any Card. We shall not elect to use arbitration under the Arbitration Provision for any Claim that you properly file and pursue in a small claims court of your state or municipality so long as the Claim is individual and pending only in that court; any appeals from that court shall be pursued only in arbitration. As used in this Arbitration Provision, the terms "we" and "us" shall for all purposes mean the Bank, wholly or majority owned subsidiaries, affiliates, licensees, predecessors, successors, and assigns; and all of their agents, employees, directors and representatives. In addition, "we" or "us" shall include any third party using or providing any product, service or benefit in connection with any Cards (including, but not limited to merchants who accept the Card, third parties who use or provide services, debt collectors and all of their agents, employees, directors and representatives) if, and only if, such third party is named as a co-party with us (or files a Claim with or against us) in connection with a Claim asserted by you. As solely used in this Arbitration Provision, the terms "you" or "yours" shall mean all persons or entities approved by us to have and/or use a Card, including but not limited to all persons or entities contractually obligated under any of the Agreements and all additional cardholders. (b) Initiation of Arbitration Proceeding/Selection of Administrator: Any Claim shall be resolved, upon the election by you or us, by arbitration pursuant to this Arbitration Provision and the code of procedures of the national arbitration organization to which the Claim is referred in effect at the time the Claim is filed. Claims shall be referred to either Judicial Arbitration and Mediation Services ("JAMS") or the American Arbitration Association ("AAA"), as selected by the party electing to use arbitration. If a selection by us of one of these organizations is unacceptable to you, you shall have the right within thirty (30) days after you receive notice of our election to select the other organization listed to serve as arbitrator administrator. For a copy of the procedures, to file a Claim or for other information about these organizations, contact them as follows: (i) JAMS at 1920 Main Street, Suite 300, Los Angeles, CA 92614; website at www.jamsadr.com; and (ii) AAA at 335 Madison Avenue, New York, NY 10017; website at www.adr.org. (c) Significance of Arbitration: IF ARBITRATION IS CHOSEN BY ANY PARTY WITH RESPECT TO A CLAIM, NEITHER YOU NOR WE WILL HAVE THE RIGHT TO LITIGATE THAT CLAIM IN COURT OR HAVE A JURY TRIAL ON THAT CLAIM, OR TO ENGAGE IN DISCOVERY EXCEPT AS PROVIDED FOR IN THE CODE OF PROCEDURES OF JAMS OR AAA, AS APPLICABLE (THE "CODE"). FURTHER, YOU WILL NOT HAVE THE RIGHT TO PARTICIPATE IN A REPRESENTATIVE CAPACITY OR AS A MEMBER OF ANY CLASS OF CLAIMANTS PERTAINING TO ANY CLAIM SUBJECT TO ARBITRATION; THE ARBITRATOR SHALL NOT CONDUCT A CLASS ARBITRATION OR A JOINT ARBITRATION. EXCEPT AS SET FORTH BELOW, THE ARBITRATOR'S DECISION WILL BE FINAL AND BINDING. NOTE THAT OTHER RIGHTS THAT YOU WOULD HAVE IF YOU WENT TO COURT ALSO MAY NOT BE AVAILABLE IN ARBITRATION. (d) Restrictions on Arbitration: If either party elects to resolve a Claim by arbitration, that Claim shall be arbitrated on an individual basis. There shall be no right or authority for any Claims to be arbitrated on a class action basis or on bases involving Claims brought in a purported representative capacity on behalf of the general public, other Cardholders or other persons similarly situated. The arbitrator's authority to resolve Claims is limited to Claims between you and us alone, and the arbitrator's authority to make awards is limited to you and us alone. Furthermore, Claims brought by you against us or by us against you may not be joined or consolidated in arbitration with Claims brought by or against someone other than you, unless otherwise agreed to in writing by all parties. (e) Location of Arbitration/Payment of Fees: Any arbitration hearing that you attend shall take place in the federal judicial district of your residence. At your written request, we will consider in good faith making a temporary advance of all or part of the filing administrative and/or hearing fees for any Claim you initiate as to which you or we seek arbitration. At the conclusion of the arbitration (or any appeal thereof), the arbitrator (or panel) will decide who will ultimately be responsible for paying the filing, administrative and/or hearing fees in connection with the arbitration (or appeal). If and to the extent you incur filing, administrative and/or hearing fees in arbitration, including for any appeal, exceeding the amount they would have been if the Claim had been brought in the state or federal court which is closest to your billing address and would have had jurisdiction over the Claim, we will reimburse you to that extent unless the arbitrator (or panel) determines that the fees were incurred without any substantial justification. (f) Arbitration Procedures: This Arbitration Provision is made pursuant to a transaction involving interstate commerce, and shall be governed by the Federal Arbitration Act, 9 U.S.C. Sections 1-16, as it may be amended (the "FAA"). The arbitration shall be governed by the applicable Code, except that (to the extent enforceable under the FAA) this arbitration Provision shall control if it is inconsistent with the applicable Code. The arbitrator shall apply applicable substantive law consistent with the FAA and applicable statutes of limitations and shall honor claims of privilege recognized at law and, at the timely request of either party, shall provide a brief written explanation of the basis for the decision. In conducting the arbitration proceeding, the arbitrator shall not apply the Federal or any state rules of civil procedure or rules of evidence. Either party may submit a request to the arbitrator to expand the scope of discovery allowable under the applicable Code. The party submitting such a request must provide a copy to the other party, who may submit objections to the arbitrator with a copy of the objections provided to the request party, within fifteen (15) days of receiving the requesting party's notice. The granting or denial of such request will be in the sole discretion of the arbitrator who shall notify the parties of his/her decision within twenty (20) days of the objecting party's submission. The arbitrator shall take reasonable steps to preserve the privacy of individuals, and of business matters. Judgment upon the award rendered by the arbitrator may be entered in any court having jurisdiction. The arbitrator's decision will be final and binding, except for any right of appeal provided by the FAA. However, any party can appeal that award to a three-arbitrator panel administered by the same arbitration organization, which shall consider anew any aspect of the initial award objected to by the appealing party. The appealing party shall have thirty (30) days from the date of entry of the written arbitration award to notify the arbitration organization that it is exercising the right of appeal. The appeal shall be filed with the arbitration organization in the form of a dated writing. The arbitration organization will then notify the other party that the award has been appealed. The arbitration organization will appoint a three-arbitrator panel which will conduct arbitration pursuant to its Code and issue its decision within one hundred twenty (120) days of the date of the appellant's written notice. The decision of the panel shall be by majority vote and shall be final and binding. (g) Continuation: This Arbitration Provision shall survive termination of your Card as well as voluntary payment of the debt in full by you, any legal proceeding by us to collect a debt owed by you, and any bankruptcy by you or us. If any portion of this Arbitration Provision is deemed invalid or unenforceable under any principle or provision of law or equity, consistent with the FAA, it shall not invalidate the remaining portions of this Arbitration Provision, the Agreement or any prior agreement you may have had with us, each of which shall be enforceable regardless of such invalidity. 30. Prefunded Check Transactions ( "Check Terms"). We may, in our sole discretion, allow you to use prefunded checks to access the funds in your Card Account ("Checks"). Checks must be obtained from us by calling the number on the back of your Card. Checks produced by other check printers will not be honored. By accepting and using Checks, you agree to be bound by these Check Terms, including the fees relating to the use (and misuse) of Checks as set forth in the accompanying "Schedule of Fees and Charges." When you write a Check, the legal effect will be the same as if you used the Card. Checks will remain the property of the clearing bank indicated on the face of the Check and must be surrendered upon demand. Checks are nontransferable, and may be canceled, repossessed, or revoked at any time without prior notice subject to applicable law. You should read and follow carefully the instructions for Check use. Prior to writing a Check, you must first contact us at 1-800-936-4360 and provide us with the number of the Check, the name of the intended payee and the requested amount of the Check. You must pre-fund each Check prior to use from the available funds in your Card Account and write the Authorization Code we provide you in the space indicated on the face of the Check. You must fill out the Check in a legible manner and date the Check the same day as you obtained the Authorization Code. If you (a) write a Check without obtaining or using a valid Authorization Code, (b) fail to fill out the Check in a legible manner or fail to date the Check on the same day you obtained the Authorization Code, or (c) write a Check using a Check number, payee or check amount that differs from the Check number, payee or check amount you provided to us at the time you requested the Authorization Code for the Check, it will not clear and you will be charged a fee. When you authorize a Check, the funds necessary to pay the Check will be transferred from your Card Account to an FDIC insured settlement account pending presentment of the Check for payment. All funds held in the settlement account will be held in your name until the applicable Check is presented for payment. When your Check is presented for payment, the funds held in the settlement account will be used to pay the Check. Checks are valid for the period of time designated on the face of the Check. This period starts to run on the date we provide you an Authorization Code for the Check. Checks not presented to the clearing bank prior to the expiration date will be cancelled and funds will be credited back to your Card Account through our normal settlement process, less the corresponding fee to credit the funds back to your Card Account (see accompanying "Schedule of Fees and Charges" for additional information). Please note that it may take up to ten (10) business days for this refund to be posted to your Card Account. In some cases, an expired check may clear if presented for payment prior to processing a cancellation and refund, in which case no refund will be posted to your Card Account. You should not use the information on any Check to process an ACH debit transaction or to set up direct deposit to your Card. If you desire to stop payment on a Check, you must contact us at 866-872-9820. There is fee associated with a stop payment request for a Check (see accompanying "Schedule of Fees and Charges" for additional information). Although we will make every effort to accommodate a request to stop payment on a Check, stop payment requests for Checks are not guaranteed and we will have no liability for failing to stop the payment. Our ability to process a stop payment request will depend on whether the Check has been presented for payment. Payees may present Checks for payment to their bank before we have a reasonable amount of time to process your stop payment request. If we are successful in stopping a payment, it may take up to ten (10) business days for the funds to be credited to your Card Account. 31. Delivery of Electronic Communications. 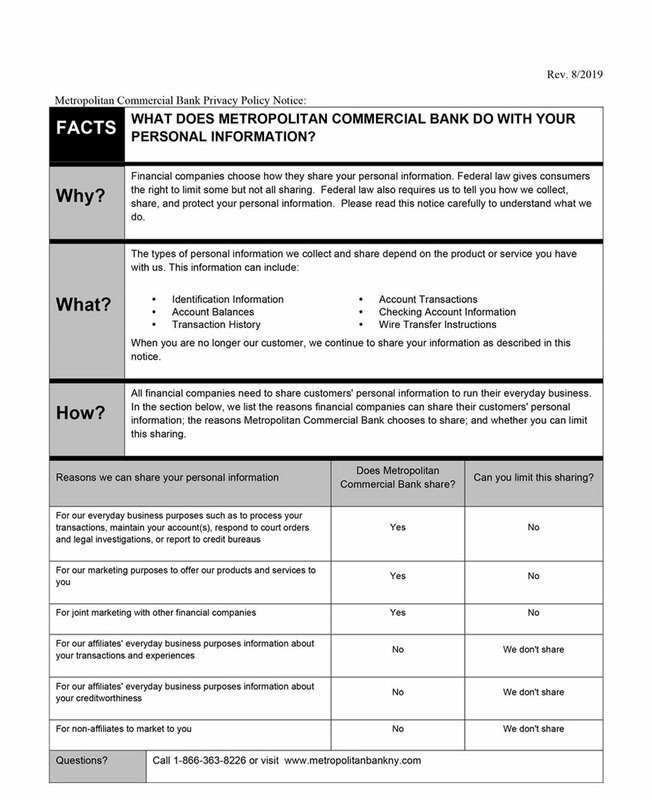 The following E-Communication Disclosure ("Disclosure") applies to any and all communications or disclosures that we are legally required to provide to you in writing in connection with your Card Account and any related products and services ("Communications"), to the extent you have consented to receiving such Communications electronically. 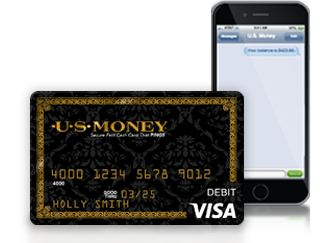 If you have not consented and would like to receive Communications electronically from us, please visit us online at www.usmoneycard.com. 32. Scope of Communications to Be Provided in Electronic Form. 33. Method of Providing Communications to You in Electronic Form. All Communications that we provide to you in electronic form will be provided either (1) by access to a web site that we will designate in an e-mail notice we send to you at the time the information is available, or (2) by posting such Communications on our website at usmoneycard.com. 34. How to Withdraw Consent. You may withdraw your consent to receive Communications in electronic form at any time by contacting us at 866-872-9820 or visiting the www.usmoneycard.com website or write to 2690 Cobb Parkway, Suite A5-232 Smyrna GA 30080. If you do withdraw your consent, we will close your Card Account, except where prohibited by law. We will not impose any fee to process the withdrawal of your consent to receive electronic Communications. Any withdrawal of your consent to receive electronic Communications will be effective only after we have a reasonable period of time to process your request for withdrawal. In the meantime, you will continue to receive Communications in electronic form. If you withdraw your consent, the legal validity and enforceability of prior Communications delivered in electronic form will not be affected. 35. How to Update Your Records. It is your responsibility to provide us with a true, accurate and complete e-mail address (if you have elected to receive e-mail messages from us), your contact information, and other information related to this Disclosure and your Card Account, and to maintain and update promptly any changes in this information. You can update information (such as your e-mail address) through www.usmoneycard.com or by contacting us at 866-872-9820. 36. Hardware and Software Requirements. • Microsoft Internet Explorer 4.7 or above, Netscape Navigator 4.7 or above, or the equivalent software. We will not send you a paper copy of any Communication, unless you request it or we otherwise deem it appropriate to do so. You can obtain a paper copy of an electronic Communication by printing it yourself or by requesting that we mail you a paper copy, provided that such request is made within a reasonable time after we first provided the electronic Communication to you. To request a paper copy, contact us by calling 1-866-872-9820 or writing to us at 2690 Cobb Parkway, Suite A5-232 Smyrna, GA 30080 We may charge you a service charge for the delivery of paper copies of certain Communications provided to you electronically pursuant to this authorization. See the attached "Schedule of Fees and Charges" for details about this service charge. We reserve the right, but assume no obligation, to provide a paper (instead of electronic) copy of any Communication that you have authorized us to provide electronically.